The betel leaf comes from the betel plant, a creeping vine that is common in areas of Southeast Asia, where it is often consumed for its medicinal properties. Originating in India, the glossy, heart-shaped leaves contain allylbenzene as well as terepenes, or essential oils. In many South Asian and Southeast Asian countries, the betel leaf is chewed with the betel nut as a stimulant. 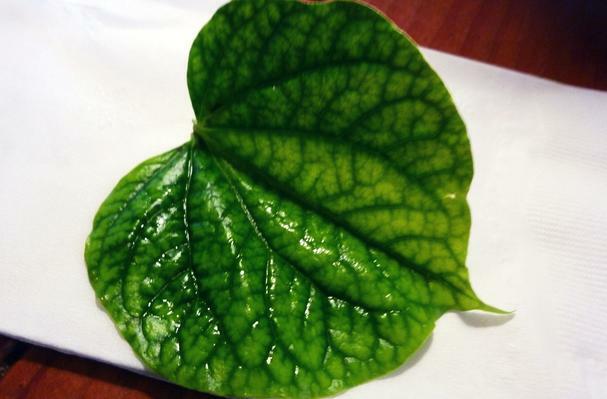 In Thai cuisine, the betel leaf is commonly served as part of the dish, mieng kum, and is used as the wrapper for a variety of fillings accompanying mieng kum.